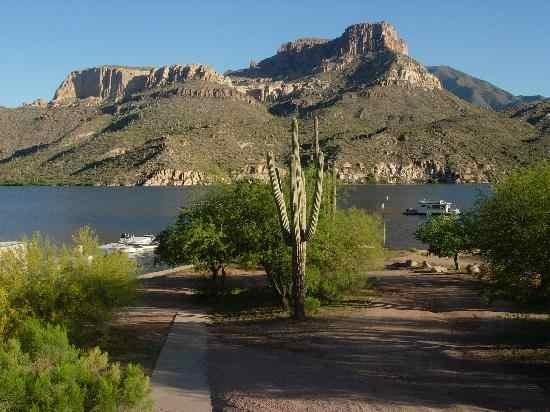 ROOSEVELT LAKE - Lake elevation is 2,098 feet, 45-percent full, water temperature 80-87 degrees). Now to the fishing report. It won't be long until the fall patterns start for bass anglers. I know it doesn't feel like it this week, but the early morning top water bite on Roosevelt Lake we talked about a couple of weeks ago is getting slightly longer each week. This trend will continue as the temperatures begin to fall. So if you don't like summertime fishing, and early fall is the time of year you like to hit the water, it's time to get ready. After the sunlight hits the water, it's time to switch to a drop shot, senkos or Carolina rig. Translucent baits and a watermelon color are popular baits this time of year. Most reports are that fish are being caught on islands or main lake points. Another angler reported fishing flats right next to deeper water. On calm, flat days, when there isn't much wave action, baits in the 4-6-inch size are being used. The water level dropped one percent this past week and is currently at 45-percent full. This is due to less monsoon rains and lower inflow into the lake this past week. The Salt River is flowing at about 398 CFPS and the Tonto Creek is slightly flowing; however, this is not enough to offset the amount of water being taken for downstream usage. Let's hope we get a few more storms to keep water level from dropping further. The temperature is in the mid-80's in the morning and increasing to the high-80's in the afternoon. The crappie bite was called poor this past week. Crappie anglers reported a better night time bite. Night time crappie fishing usually requires live minnow. 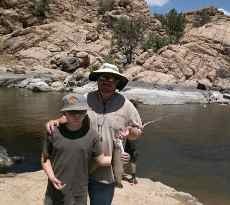 If you fish Roosevelt this week, be extremely careful of the monsoon storms. If you're like me, even a 10-percent chance of a storm makes me wary. Always put safety first when on the water. 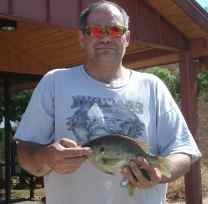 Pictured Above is Ernie Smith with a nice Redear he caught. Previously, Gary Senft, a Bass Pro at Bass Pro Shops, fished the lake from Friday night to Sunday. Dropshots and Texas rigs produced the best bites. The top-water action was slow at times, as was jig fishing. Each day, Senft fished beginning at 6 p.m. and fish were hitting dropshots of 4.5- and 6-inch morning dawn Roboworms. Powerworms of 7 inches in dark colors also produced at night.